I often get questions about what to use as price tags in your own brick & mortar store or antique mall. 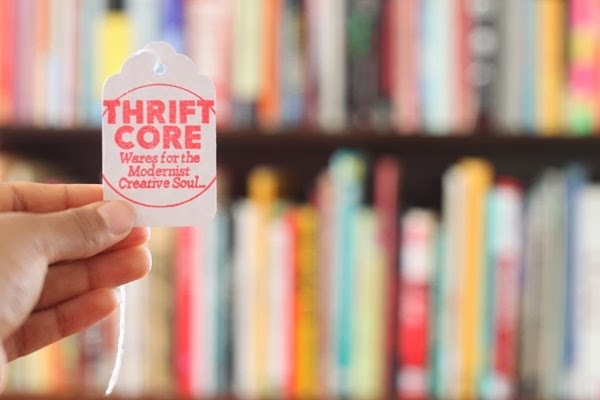 Tags are less important than staging and the merchandise itself, but it does help you set yourself apart from the competition and can even make your work more memorable. I investigated ordering pre-printed, pre-strung price tags to save time and match my online and offline branding perfectly, but I'm glad I went with a custom-stamp. I'm still testing my custom stamp so I can't recommend a custom-stamp maker for you yet, but I'm enjoying this one so far. I'd never seen an acrylic stamp before and it took some practice, but once I got used to it I discovered these weirdo clear rubbery stamps are The Batman of making a detailed, extremely crisp (not blurry or inky), straight impressions. I tested various inks and stamp presses and recommend this Fiskars Stamp Press (must-have for acrylic stamps!) and Memento Ink. The VersaFine Inkpad was recommend by my stamp-maker but I tried Michaels, Jo-Ann, Office Depot, Staples, Hobby Lobby and Walmart (ow, my gas) and it's not available in red locally. Waiting on it to arrive in the mail. The acrylic stamp photo in the previous picture is actual-size, these are somewhat campily large price tags. I feel like that goes with my playful aesthetic and helps me stand out, although, it can make my booth look a little crowded if I don't position them carefully. I may have to develop smaller stamps and tags, too to diversify it a bit. My favorite part of the hand-stamped tags is the tangible, hand-crafted quality you can never get from computer printed tags. Each one is slightly different and there's something so visceral and tangible about a hand-stamped item. It's the reason why shoppers go for vintage in the first place, and the use of the traditional white hang-tag keeps it nostalgic. What do you use for price tags? What price tags do you respond to? Got any more advice on stamps and ink to share? I'm excited to keep updating packaging- business cards and postage goodies next! Glad you did the post! As I mentioned to you before, I found Staples had a variety of sizes in these price tags to play with and of course the prices vary too. I'm hoping to find a local custom stamp maker once my eldest daughter who is an art major finishes our designs. But until then I'll be printing our price tags up using the Avery printable tags. You must have a steady hand to get the stamp so perfect. Thanks for providing the links for the ink, etc. Great job! I appreciate the info you shared on the printable Staples tags, I love how you can print the item description on the back of them that can look so professional for the right type of booth- hell, any booth. I have hilariously unsteady hands for a former art student, it got me in trouble for Graphic Design I! I ruined about 12 tags before I got the the hang of the stamp and testing other presses and inks. The stamp press especially helps keep it from moving, but you can put you press down with your hands and make a decent impression, too. Great tags! BTW, loving the elephant, too! The Elephant's a favorite recent find, it's actually a lamp I need to a lamp kit and shade for! Looks great!!! I use stamps on my price tags too. It makes it so easy for the employees at the front to ring up my stuff because my booth number and vendor id are always easy to read. I've been wanting one with my logo on it for a while. Where did you go for yours? Good idea to stamp the booth/vendor ID #! I may order extra stamps for booth # and my website to put at the bottom. Lots of packaging to design! 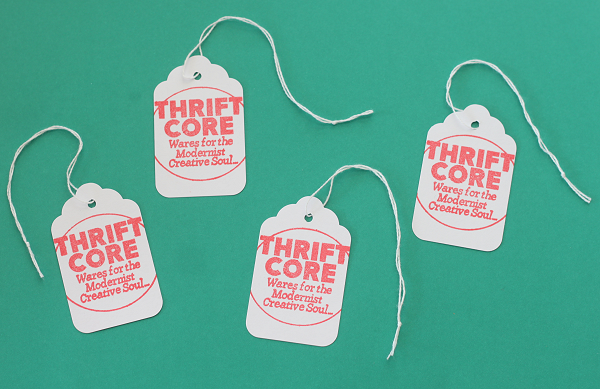 Oh yeah, e-mail me at info@thriftcore.com if you find time to visit. St. Augustine is nearby and it's one of my favorite cities in the world, simply beautiful. I want to go on a ghost tour this year! I use computer printed ones for now, and similar shades of pink cardstock, with my birds-on-a-line theme printed on them. They match the sign in my booth. I handwrite the vendor and item number, price, and description though. I have to swing by the booth today, if you'd like the mug I can easily grab it for ya. 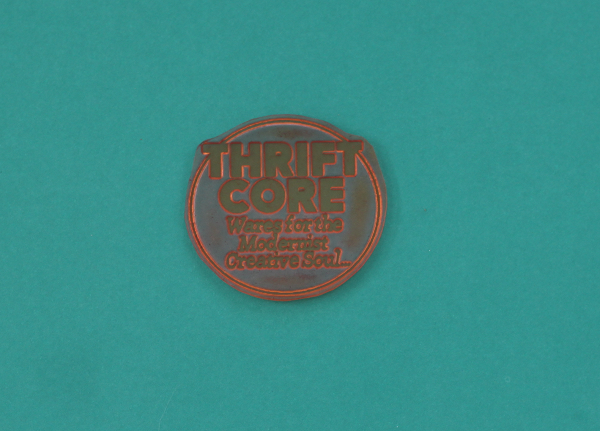 E-mail me at info@thriftcore.com with your zip code so I can calculate shipping and give you the price. Don't let the slow sales bum you too much, I had a couple of no-profit months when I first started before I got things more steady. IF the foot is traffic, sometimes it pays to wait it out. Although sometimes you also have to get out if you're gut's telling you it won't work like I did with two malls I really enjoyed being in even though it wasn't working. Glad the tags are giving an unpretentious, approachable vibe! Happier I didn't go with the glossy printed route, it can look too-retail and takes away from the charm of running and indie business. And about that pricing, I'm working on getting mine up. It hurts and I've been avoiding it for a while but research keeps pointing to this being the way to go to survive. I'll have a follow-up post on that soon, too. Good luck selling and getting the vintage Etsy shop up, I love mine and I'm glad I did it. Next, an eBay shop! Thanks Megan! Things are 'a changing behind the scenes. Improvement, HO! I had toyed with idea of a snap ages ago. But I went my business card being printed on recycled card. So I have doubled up the use of my business card and used them as swing tags too with a raw brown garden twine as the string. I've received lovely feedback fom fellow resellers on the look. So I figure if a fellow reseller is impressed it must be a good choice I went with. I think those tags add a nice touch! And I like that they are big. I hate hunting for the price on something. Thanks Tilda! That's what inspired me to make the huge tags, a lot of people will just walk away (rightfully so) if they can't easily find a price on an item. I like to make it as easy as possible! I love the new tags. I did enjoy the ones that used the scan of an older comic book. I'm loving the red lamp. So cute!! Thanks Usagi. I liked the comic book scan too, definitely different from anything else in the mall. I feel like the new ones are more professional though, will speak to a broader demographic and allow me to raise prices too. The big tags means I can write much more info on each tag. :) Strategy seems to be working thus far. I agree that large tags are the best tags. I like your stamp! Thanks Jeannie! There is no guess work with large tags, and they're fun to hold. Looking good. My sister.got a custom stamp for $29. IDK WHAT you paid. This was offline. I've gotten a couple custom but ya don't got a booth hers was for her business and looks great too. Mine was $22 with shipping I believe from the UK so it was one the cheaper options I can find, pretty good quality from what I can tell still. I think this is my favorite of all the tags you've created. I love the use of hang-tags, but actually prefer the traditional brown or manila colors. Like you said, there is something special when I see a hand stamped tag. Everything nowadays looks so perfect and nice and neat that you lose some of that handmade quality of things from the past, so I'm glad you're hand stamping your tags. Thanks for sharing the info on the Fiskars stamp press. Didn't even realize you could get something like that. That makes for much easier stamping, esp if you're doing a bunch of tags (or cards). Will need to look into it, as stamping is not my forte. They're my favorite, too :D I like the brown/manila colored ones too but went with the white for now, seemed to suit my brand better. The stamp press is AWESOME for acrylic stamps, was worth the investment! I'm new to the flea market world of resell. I was inspired by you to make my own tags for my booth (and name it). I put out the first items with the new tags this week and already have had additional interest in my booth. The branding really does help you stand out! Good luck.